The distance from our home to our childcare center is less than three miles. In rush-hour traffic, it’s a 20-minute drive. But almost every day, Nicholas and I make the trip by public transit, taking two buses and at least 45 minutes in each direction. I could walk that distance in that time! Am I insane?! No. I’m convinced that public transit is a wonderful way to travel with a young child. The conveniences more than make up for the inconveniences, that extra time is time we spend together, and the trip is full of learning experiences for my child and me. The best thing about it is that I get to ride instead of driving. I can look at the scenery, read to Nicholas, or have a conversation with him. If traffic or weather makes driving difficult, I’m not the one getting stressed out over it. I don’t have to park the car. The neighborhood where I work is packed with offices, hospitals, universities, and museums, all competing for scarce parking spaces. A parking lease–good only in a particular garage, where I’d rarely want to park except for work–costs more than the bus pass that gives me unlimited travel around the city. The streets really close to work and childcare have restricted parking, so I can’t leave my car there all day. Several blocks away are a few residential streets with free parking. Of course, a lot of other people want to park there, so spaces are scarce. Heavy traffic means that I drive around at a snail’s pace and sometimes can’t turn where I want to. Usually it takes me 20-30 minutes (after dropping off Nicholas) to find a parking space and walk from there to work, so the total time between leaving the house and getting to work is about the same as when we take the bus. Rain or snow can make waiting at the bus stop uncomfortable, but once we get on the bus, we’re in a big, safe vehicle that’s unlikely to skid and would fare well if it crashed. Given the distance from parking to my office, I get soaked anyway if I drive on a rainy day. I keep extra clothing in my office, and Nicholas has extra clothing at school. When we get wet or cold on the way home, we get to have hot cocoa before dinner! When we take the bus, we don’t have to struggle with carseat straps. (Buses are much safer than cars.) We get to sit in different parts of the bus and often get a choice of seats, whereas in the car we always have to sit in the same places, looking out at the same angles. Nick can sit in my lap on the bus. That’s illegal in a car. When he was an infant, he often slept in the sling while we were traveling, and I didn’t have to disturb him to get on and off the bus. It was possible to nurse him on the bus (though I did that only a few times; usually he was too busy watching people to think of nursing), whereas in the car I had to listen to him shriek until I could stop. We meet people. Instead of being isolated in our car, we’re walking through the neighborhood, standing on the corner, sitting on the bus right next to all kinds of people. Sometimes we see friends, and spending that time with them is an unexpected pleasure. Sometimes we get to know new people and have fascinating conversations. Sometimes we just enjoy watching all the different types of people who ride the bus and thinking about where they might be going. When the weather is uncomfortable or the bus is late or crowded, we have company in our misery, and it seems not so bad. I can read to Nicholas on the bus and at the bus stops. That helps to pass the time, and it gives us new ideas to discuss together. Sometimes we notice that our fellow passengers are listening to the story, too! I can give my child my full attention. He’s right there with me, and I don’t have to keep my eyes on the road. I can unzip his jacket, wipe his nose, save him from choking, or whatever he needs, right away, without endangering the public or wrenching my back trying to reach the carseat and steer at the same time. We practice balance. Nicholas outgrew the sling carrier at 21 months and began learning to get on and off the bus and walk down the aisle of a moving bus on his own. He quickly became adept. Sometimes I marvel at how well he keeps upright when he isn’t even tall enough to reach the posts that I grab frantically when the bus jerks. The steps are so high he has to swing his knee up to the next one, instead of stepping up with his foot, but he takes it in stride and moves as fast as many adults. These skills are helping him around the house and on the playground, and they’ll be useful in sports and dancing later in his life. Nicholas is learning to walk. I mean, of course he learned to walk when he was one year old, but as we walk between bus stops and destinations he’s learning to walk long distances at a reasonable pace. I do have to walk more slowly than I would alone (that’s why the above “I could walk that distance in that time!” is not a useful thought) and sometimes wait for him to catch up, but I walk with the expectation that he will follow. Over time, his demands to be carried have gotten less frequent. I doubt he’ll grow up into someone who whines about being unable to find a parking space near the gym! Last night, we missed our first bus, and rather than waiting 20 minutes for the next one, we decided to walk straight south and meet our second bus there. Nicholas trotted along steadily–with occasional pauses to pick up acorns or admire church windows–and covered 3/4 mile in 25 minutes. He’s learning transit-rider skills. He knows how to pull the stop-request cord (and that we don’t pull it except when approaching our stop) and how to hold the pass so the driver can see it. He’s beginning to learn the numbers of the routes we ride and which stops we use when. He knows that sometimes we have to run to catch the bus. We have an adventure together every day. We wait at a stop in our neighborhood’s business district, watching the busy scene of pedestrians, dog-walkers, delivery trucks, and emergency vehicles. We ride past a university campus, past a museum with art banners and a fountain and statues. We change buses on another university campus and watch the students changing classes. Coming home, to get from one bus to the other we walk past the Cathedral of Learning and often go inside to get a drink of water and admire the glorious Gothic architecture. Once in a while, we ride the elevator up to the 36th floor and look at the view. On the Cathedral lawn, we see students socializing, studying, playing sports, and one time building a ramp out of imported snow for a snowboarding competition. When we come past at sunset, we salute as ROTC members retire the flag. Every day we count the steps from the upper level of the lawn down to the lower level. (There are 47. There will always be 47!! Argh.) 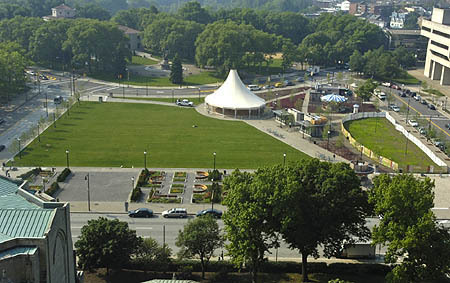 Then we walk past Schenley Plaza, with its picnic shelter that Nicholas calls “that big lamp,” to the dinosaur bus stop to catch our final bus and ride home past another dinosaur statue and an abstract sculpture Nicholas insists is also a type of dinosaur. Our route presents constant opportunities to talk about things like how food gets to the grocery store, why people build sculptures, what dinosaurs were like, why fountains are turned off in cold weather, architectural styles, ants, plants, sports, and the similarities and differences between a flag ceremony and a church ritual. Sure, we could have some of these conversations in the car, but it’s harder when I’m busy driving and we can’t see each other’s faces . . . and when we drive, we take the most direct route, bypassing most of those interesting places. Taking public transit is a waste of time only if our measure is the number of minutes elapsed between home and childcare. The journey is so much more than that! Fitting all that learning, talking, reading, cuddling, and exercising into our schedules alongside a car commute would be a lot less efficient. UPDATE: Four years later, I’m linking this article to Your Green Resource, a collection of tips for earth-friendly living. I still commute by bus every day, but now Nicholas goes to school in our neighborhood, so he only gets to ride the bus occasionally on weekend excursions. He misses it, and I miss my commuting companion! But we both enjoy walking to school. Its good to have a journey together with your child. So that the child will learning something.